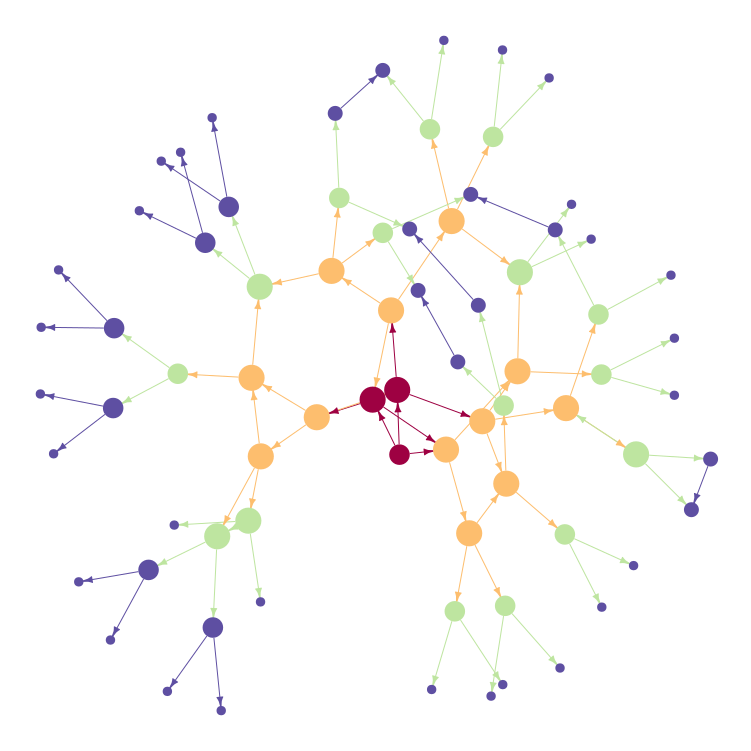 I'm creating a network graph in R and exporting to Inkscape as a PDF (see image below). I would like to move the nodes around and have each node's edge (line connected to it) move with it. Is this possible to do in Inkscape? My approach now is to ungroup the object, move a node and then try to move each edge and arrow object so that it lines up. But, this will take too much time. Is it possible to anchor one end of an object and move the other? Or is there a workaround to this? You can use the Create Diagram Connectors tool to make live connectors. Simply select the tool, mouse over a circle until you see the centre connector indicator, and click and drag to another circle connector indicator. You can then add arrow points in the stroke dialog. You can then move the circles with the Select and Transform Objects tool (F1), and the connectors will follow the circles. Obviously with this technique you can't automatically turn the arrows in your existing PDF into connectors, they'd have to be deleted first and then redrawn using the Diagram Connector tool. So, there's some manual work involved.